AVCHD, instead of MMV, is now widely used in recordings in Sony’s camcorders and it is acting as a video file and can be played through QuickTime player or IINA via double click on macOS. However, when I try to load AVCHD for converting to MP4 or MKV, I have little trouble but is able to fix it myself and want to share my experiences of how to convert AVCHD to MP4 or MKV, mainly on macOS including macOS Sierra, High Sierra, and 10.14 Mojave. But the guide will also apply to WMV, AVI or MPEG converting of AVCHD on both PC and Mac. When I try to load AVCHD to my AVCHD MTS converter Wondershare Video Converter Ultimate and find it not recognizing my AVCHD files Sony camcorder recorded. Mac Video Converter does not recognize the files either from my camera, resp. from the SD memory card on my MacBook Pro. 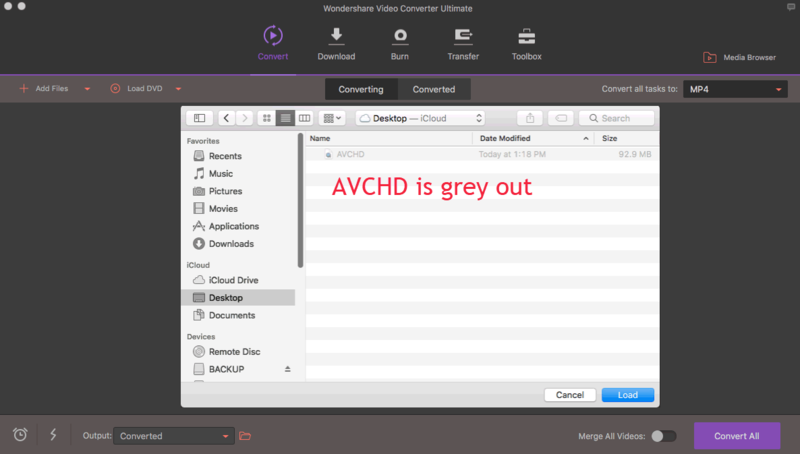 AVCHD is also grey out when you try to add it via Add Files button in Wondershare Video Converter Ultimate. As I am also running Windows, I find something different how AVCHD acts in macOS than in Windows. macOS is very helpful in handling those kinds of folder structure movies, like AVCHD, for editing in FCP or iMovie, but if you come across a problem importing AVCHD to video converters for further converting, you are supposed to follow the guide below and locate the actual video files in .mts that are all hidden in Mac OS X Mountain Lion and later. Though this way you are able to add AVCHD for any AVCHD MTS converter supports MTS for converting. When comparing with other Mac Video Converters and Wondershare Video Converter Ultimate, I’d like to recommend Wondershare as the best way out as it supports dragging and dropping AVCHD to the program instead of locating the MTS media file in AVCHD for converting. And my below shows you to use the very AVCHD MTS converter to convert your camcorder files in AVCHD to any file like MP4, MKV, AVI, WMV as well as devices like iPhone/iPad and Android-based phones, tablets, and TVs. 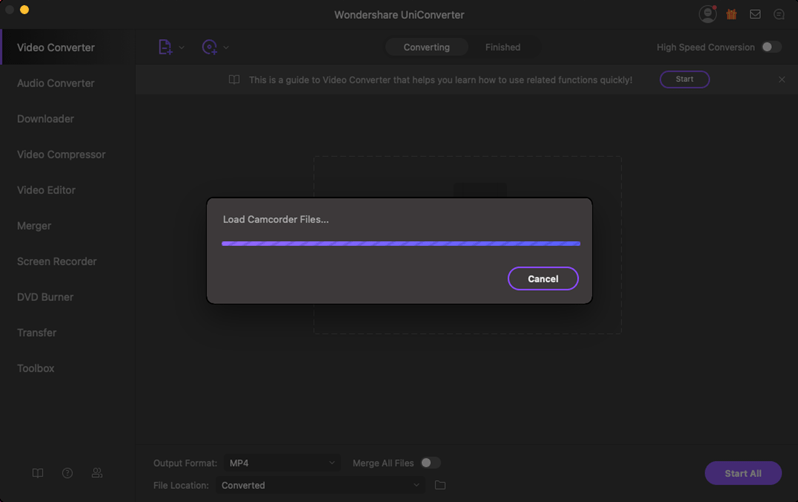 Wondershare Video Converter Ultimte is said to be able to convert AVCHD, MTS/M2TS, MKV or any other HD & SD videos with its built-in engines to support up to 350 video and audio codecs in MPEG4, H264, VP8, DivX, Xvid etc including the 4K and 3D formats. Let’s see how Wondershare works with AVCHD files and convert them to MP4 MKV AVI WMV. Follow the below two buttons to have a free trial version of Wondershare Video Converter for AVCHD. If you already have it, please go for step 2. MP4 comes as the default output profile for converting AVCHD in Wondershare. You are always free to choose another in “Convert all tasks to” or custom your own via the Edit button on the right. If there is no edit or merge needed, you can just hit Convert All to start converting. If you convert it to MP4, you are supposed to enjoy your AVCHD files on any computers or devices. Besides, there is one thing that I have to point out that even you are able to drag or remove the mts files out does not mean you should. You will always need the special structure on Mac OS X to import into FCP X. So, it is better to leave the AVCHD in its original type.